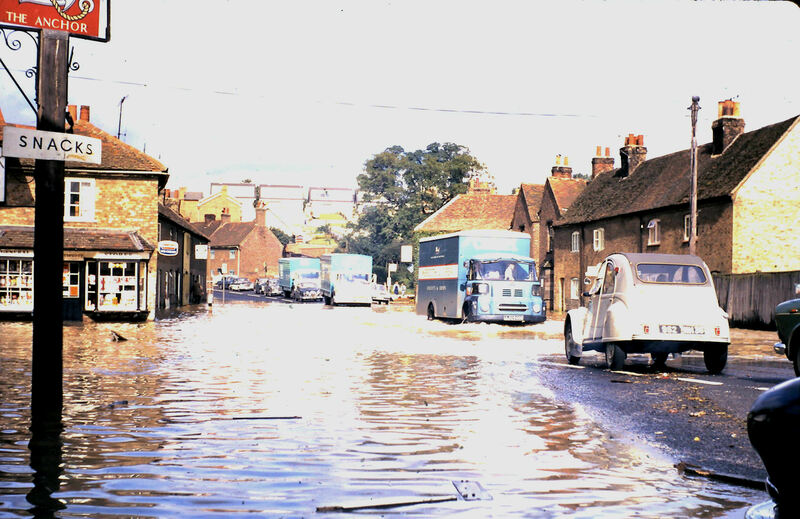 On 16th September 1968 serious flooding took place in the area of the Lea Valley. Many roads were impassable by mid-afternoon but the flooding peaked during the night when there was about three feet of water in the High Street at Stanstead Abbotts. In the aftermath police officers were called in from all round the county to assist. Once the waters had subsided local residents were left to clean up and dry out. The photograph at Barwick Ford was taken mid-afternoon. At the time I visited (off duty) the water was almost up to the house standing off to the left of the picture. Alec Bonnett, a farmer who lived nearby told me that the owners were on holiday in France: would it be all right if he broke in and moved their furniture to his barn on higher ground? I told him that I was sure the owners would have no objections. I suspect Alec was going to break in regardless, but he obviously felt better having asked a local policeman! 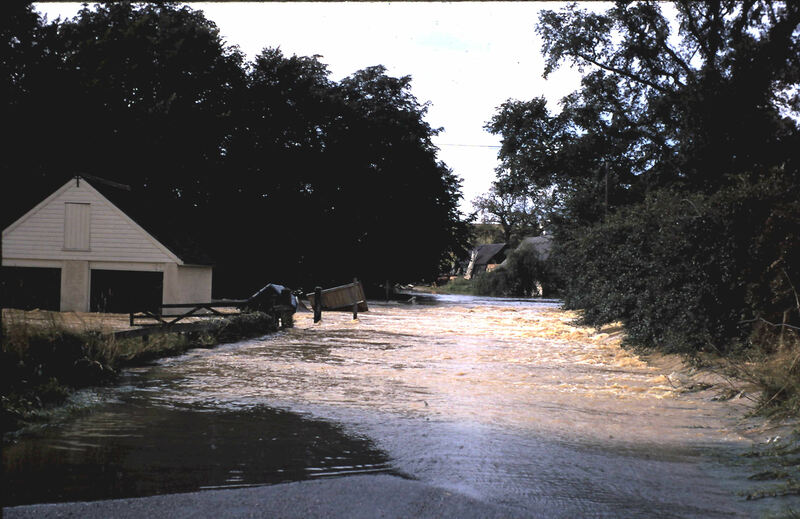 Top picture: Barwick Ford, north of Ware. The footbridge had already been washed away. Normally you could drive through here without any problems. 2nd picture: what was then the A10 at Wadesmill. The Citroën 2CV is on French plates – not much of a holiday! 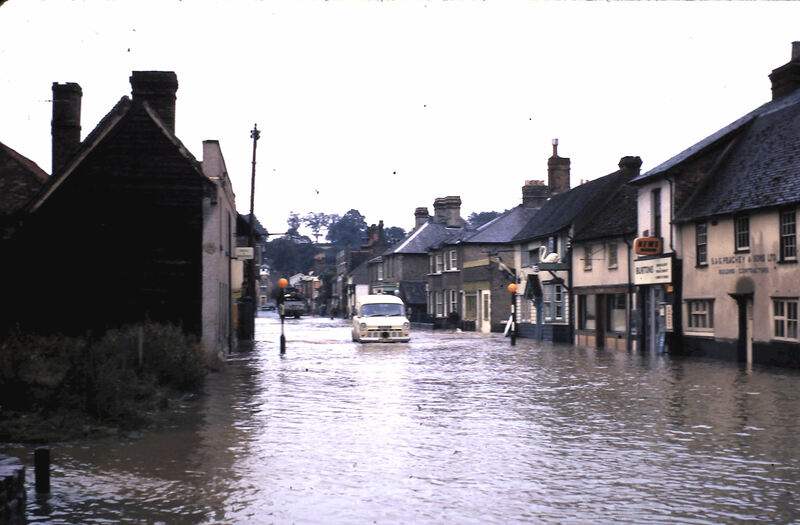 3rd picture: High Street, Stanstead Abbotts. By daylight the flooding had reduced considerably so a police Ford Transit could negotiate the water. 4th picture. P.c. 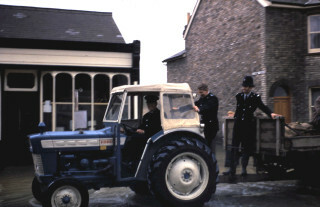 Mick Pascoe ferrying officers along the High Street at Stanstead Abbotts.